Cook the potatoes in water with the amount of salt you prefer for 15 to 18 minutes. Try not to overcook so that the potatoes don’t break-up when mixing. When finished, drain and transfer to a container with fresh cold water and let the potatoes chill completely. Then drain again and transfer to a serving dish. For the dressing, mix the mayonnaise, cream, agave and a pinch of salt and pepper. Pour the mixture over the potatoes and combine the remaining ingredients until well incorporated. You can also use canned tropical fruit; drain well before using. Try adding walnuts, almonds and golden raisins. This time I’ve brought for you a rica recipe; it’s easy to make and your whole family will love it. The main ingredients are sweet, sour and juicy, and combine perfectly with the mayonnaise or a Greek yogurt dressing. 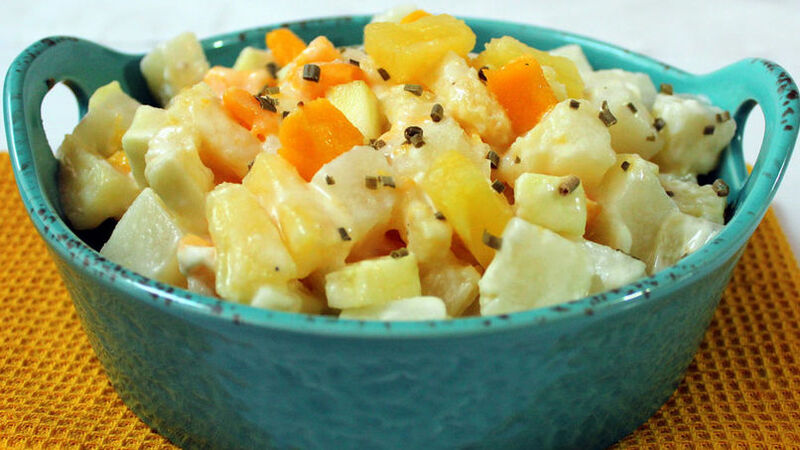 I invite you to try out this refreshing potato salad with a Caribbean twist; this is the ideal recipe to prepare on those hot days when you’d rather not spend too much time cooking. Serve with grilled chicken or meat.